We interrupt the barrage of fresh-hop posts with a question that's been on my mind for a while. What is it that makes cherries work so well in beer? The first fruit beers I became aware of years ago were made with raspberries -- I'm sure Celis Raspberry is the first I tried, and from that I learned that there existed this "frambozen" category of Belgian beers. Raspberries are still the most common fruit adjunct -- an unscientific search for raspberry on Beer Advocate came up with 357 matches -- but cherries seem to be the second-most common, and for my money they're the best. 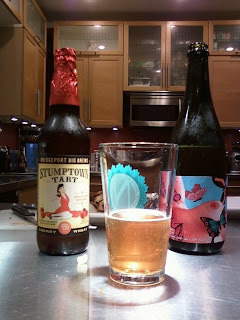 Last night I took a couple of cherry beers over to the neighbors' house: Upright's Four Play and Bridgeport's 2009 Stumptown Tart. It seemed a little risky keeping that bottle of Tart in the basement for a year, but that's what Karl Ockert told me to do, so I did it. It held up very well -- it is about 7% ABV -- and even a fruit-beer skeptic like Dave was impressed. Of the three years of Stumptown Tart, the cherry one is my favorite, hands down. Not really sour, with a nice cherry-pie flavor over the mild Belgian ale. Very similar in flavor was the Upright Four Play that's been sitting in my fridge for about six months. It's not as strong at 5%, but had the same level of cherry taste, and I liked it even more than the Bridgeport. It was just slightly tarter, and had a more interesting balance of flavors. That's the Four Play in the glass in the picture; really the two beers looked remarkably alike in the glass. The other cherry beers that have been on my mind are the Cascade Kriek and Hair of the Dog Cherry Adam. I'm glad to be able to get the Kriek in $6 doses now that the Barrel House is open, instead of having to plunk down $16 for a bottle of it. Sours are definitely an acquired taste, but I've acquired a taste for that one. It's a work of art. As for the Cherry Adam, I had a fabulous bottle of it about a year ago; more recently there was a less inspiring undercarbonated version on tap at the new Hair of the Dog bistro. I love the smoky taste of Adam, and the cherries bring a beautiful new dimension to that, so I'm going to keep hoping for a repeat of that first batch I tried. If Deschutes ever releases another batch of Dissident, that's one with cherries. A damned good one. There are a myriad of Cherry Lambic Krieks and Cherry infused Beers from Belgium. These are the original inspiration for American versions. @Jeff: The Dissident had cherries? I thought it had lemons in it. Seriously though, it was too sour for my tastes. I'll try it again next time to see if one of us has changed. @Reggie: Yep, care to name a favorite out of those? Bill, if Deschutes ever releases it again, go down to the pub and have a pour there. It was way less sour when it was released two years ago--then the buggies got to work. One more: Wisconsin Belgian Red by New Glarus, which features Door County cherries--a big deal in badgerland. Description: Eighteen months in isolation, The Dissident is a distinctive Flanders-style brown ale, with a fruity aroma and flavor. Our only wild yeast beer, brettanomyces and lactobacillus impart its characteristic sour taste. Lavished with whole western Washington cherries – pits, stems and all – (which, by the way, our brewmaster picks out personally during family vacations, to the tune of much eye-rolling from his children). It’s our wildest, most expensively pampered beer. Hopefully it will be available at the Portland Pub later this month. Sam Adams Cherry Wheat. In the perfect zone between "authentic" (which translates as 'horrifically sour' to me) and ultra-sweet (Lindemann's, etc. ).